Medium (18-24 Mos) - $34.99 Only 5 left! Large (2T-4T) - $34.99 Only 6 left! X-Large (4-6) - $34.99 Only 1 left! Aha! You must be the great hero whose arrival was foretold long ago. The one who's braved the wail of the banshee, the howl of the djinn, and the screams of a thousand nameless specters? Well, you're every bit as brave as they said you'd be, considering that you've handled all that and you're still interested in this deceptively cute Toddler Ghost Costume! You know, some people with special talents keep their personal and professional lives separate. We hear stories, for example, about how a few of the funniest comedians refuse to make jokes when they're off the clock. And we can't blame them, because making great jokes takes a lot more work than you might think! But a true hero never takes a moment off. They're always thinking about how to help others. 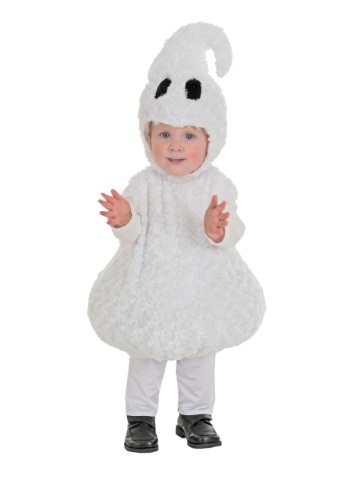 That's why we think it's pretty noble of you to risk a few shrieks so that everyone in your neighborhood can see an adorable Toddler Ghost this Halloween! It might not save any lives, per se, but we're sure that this spooky outfit will raise everyone's spirits. And since your task should be no more difficult than absolutely necessary, this costume is designed to aid you with its pullover design and convenient hook & loop fasteners on the back of the tunic and under your child's chin. We regret that we cannot assist you any further in your quest, other tiny costumes are crying out for our immediate attention. And you're the real hero, anyhow!